Abu Dhabi: The number of respiratory illnesses reported to healthcare facilities has been on the upswing since the advent of winter, and doctors are advising residents to have their air conditioning ducts and systems serviced. A thorough cleaning of these systems can often reduce the severity of respiratory illnesses, especially among those who have allergic rhinitis and asthma, they said. About 14 per cent of UAE residents are known to suffer from asthma and allergic rhinitis, and these conditions are harder to manage in homes with allergens. In addition, patients can find it harder to breathe during winter days marked by heavy fog, which also bring with them ambient pollution. “It is advisable to have the air conditioning ducts cleaned annually, especially if one or more people in a family suffer from allergies, or if there are pets at home. Winter is a particularly good time because the air conditioning systems are not in use all the time. To be honest, many families would be surprised to see the amount of dirt and mould that would be eliminated during a cleaning session,” said Dr Imad Ali, paediatrician at Amrita Medical Centre. The fine dust that collects in uncleaned ducts can contain as many as 1,000 dust mites, and up to 250,000 allergenic dust mite faecal pellets, and these trigger nasal and respiratory symptoms in people with pre-existing allergies. In addition, mould, which is also known to exacerbate allergies through released spores, can also build up in these pipelines. Dubai’s Rashid Hospital, which treats about 1,500 asthmatic patients each year, has previously issued a recommendation to regularly clean air conditioning ducts in order to avoid the accumulation of dust and fungal allergens. 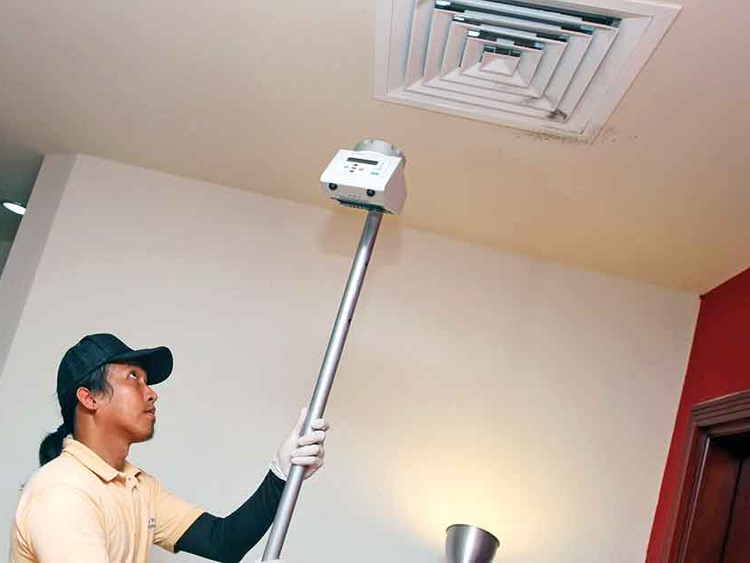 While general maintenance is provided for most apartments and villas in the capital by landlords and property management companies, the cleaning of air conditioning ducts is not included in most maintenance contracts. Residents therefore have to request the service, and often pay for it themselves. Steven Curbelo, partner and operating manager at maintenance provider Brooklyn General Maintenance, said there has been increasing demand for duct cleaning services this year. “We see between 12 to 24 residential clients a week, and in addition to cleaning, we try to educate residents about how to efficiently use their air conditioning,” he said. Curbelo said the cleaning of ducts in an average two-bedroom apartment typically costs between Dh2,000 and Dh4,000. While the exact toll of unclean air conditioning ducts on resident health is not agreed upon, many who have had their units serviced vouch for the benefits of cleaning. One British resident said her children had fewer bouts of the flu after they had their air conditioning ducts cleaned.